NOAA is reporting that there has been a large influx of harp seals into Northeast region waters. Harp seals typically are found from the Arctic to the southeast coast of Atlantic Canada, but they have been known to venture much father south. "In the spring, the Western North Atlantic harp seal population migrates to the waters around Newfoundland and Gulf of St. Lawrence to give birth to their young on pack ice," said Gordon Waring, who leads the seal program at NOAA&apos;s Northeast Fisheries Science Center laboratory in Woods Hole, Mass. 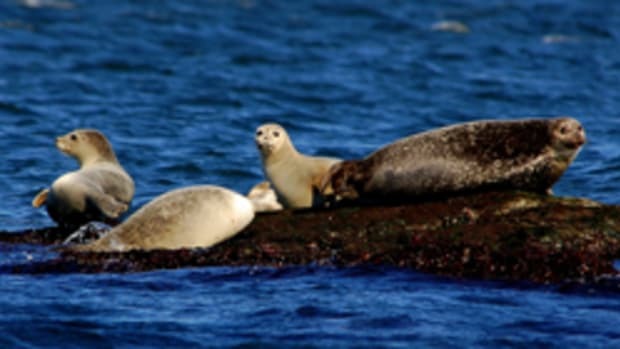 "However, in the past few years, we&apos;ve seen an increasing number of adult and juvenile harp seals in U.S. waters from Maine to New Jersey in the spring." So far this year, the most southerly reported sightings have occurred off North Carolina, while last year there were seven harp seal sightings reported off Virginia during this same time period. Two juvenile harp seals recovered from New York beaches by the Riverhead Foundation for Marine Research and Preservation were fitted with satellite tags in February. As of March 7, these animals were reported to be in the deep waters of Hudson Canyon, having travelled distances of 213 miles and 155 miles respectively.